In order for a company to supply electricity or natural gas to customers, they must be licensed by the CRU. The CRU license ensures that they are obliged to follow all of the necessary customer protection and safety regulations. If you would like to know more about the process of applying for a supply license, please visit the licensing section of our website. Competition in the market means that there are many suppliers to choose from and customers are able to switch between them in order to get the best deals. Switching energy supplier is free and easy to do. Better still, switching energy supplier can save you money. If you are considering switching supplier, then we have useful information on switching and about how to use accredited price comparison websites to get the best deals, go to the Switching Supplier page of our website. There is a list of suppliers for both the electricity and gas markets below. The table shows which markets each supplier operates in as well as whether they supply domestic and business customers. If you want to find out more about the suppliers, you can click on the link in the table below and this will bring you directly to their website. You will be able to find information about the supplier, their tariffs and contact details on their website. 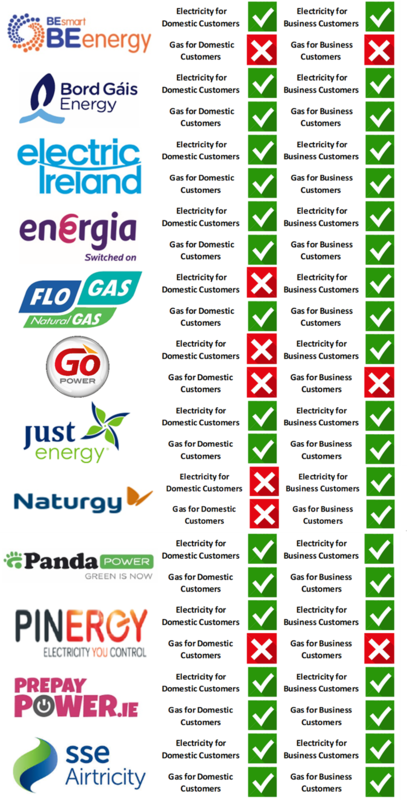 We know that choosing an energy supplier can be confusing. We at here to help you, so if you have questions about switching or about any other area, please feel free to contact the CRU’s Customer Care Team. To see the different ways to contact us, to find out how, visit the Customer Care Team page.